Summary: An incredibly moving new musical telling the untold stories and singing the unsung heroes of 9/11 in the small town of Gander, Newfoundland, where 38 planes carrying 7000 people (and a few animals) were diverted. Highlights: Friends, I know I told you yesterday that Dear Evan Hansen is THE musical of 2017, but I need to amend that statement. Come From Away is every bit as revolutionary, necessary, and timely. It's brilliantly constructed by this Canadian husband and wife team to tell a dozen or two stories in a seamless, applause-free hour and 40 minutes using a folky Celtic score that honors the heritage of the region. This isn't the typical dialogue-song-applause-repeat style of musical, it's continuous storytelling with music and movement flowing in and out of dialogue. If there were a Tony award for best ensemble, this beautiful 12-person cast would be a shoe-in. They all play multiple characters, effortlessly morphing from one character/accent/costume to another, and making each one (based real people) so real and relatable. Stories include American Airlines' first female captain, the mother of a NYC firefighter, a couple finding love and a couple losing it, and the woman from the local ASPCA who cares for the animals on board. The awesome eight-person band (including traditional instruments like Irish flute, bousouki, and bodhran) sits onstage amongst the trees on the right side of the stage, and even gets to take part in the storytelling during a pub scene, with a post curtain call performance that turns into a celebratory Irish session. The events of 9/11 changed all of us, no matter who we are or where we were that day. Come From Away taps into that universal shift in identity by telling the true and very human stories of Gander, and giving us a moment to live in that in-between space that wasn't then and isn't now, a time when strangers and and a close-knit community came together to help each other through to the other side. I had never heard their stories before, and I'm so glad someone is telling them in my favorite storytelling style - musical theater. 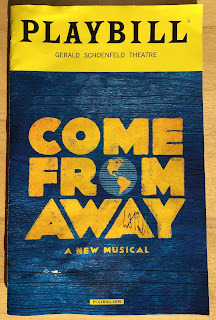 I can't recommend Come From Away highly enough, but don't forget to bring many tissues for when you feel all of the feels.